I am not a financial adviser, but can share my opinion. And if you have invested in any of P2P platforms, would be glad to hear about your strategy and results so far in the comments as well. I have not done any tests with Bondora, because their loans don’t have guaranteed buybacks. If the largest P2P platform in the world has done some shady stuff, I would not be suprised if smaller platforms repeat similar actions. For this kind of platform to make money, they need lot of loans to be funded and that might motivate platform owners to “improve” their loan scoring models and make everything look much better than it is, specially – if they don’t take any risk themselves. So I am staying away from Bondora and would not recommend to invest there. Even if I trusted their management completely, it just does not make any sense to get 10% return they promise if I can get the same results from other P2P companies but with additional buyback guarantee. Twino had a very promising start – 14% interest rates, guaranteed buybacks and P2P company was combined together with Finabay that issued loans. For more than a year everything was very stable – my money was invested, just needed to lower min interest rate in my Auto Invest portfolio once in a while. In the end I had set it to 10%, but it still seemed reasonable. Situation changed in the last 3-4 months – for some periods money was not invested. As the situation was not that bad (about 10-15% not invested), I did not change anything. But 3 weeks ago on April 28th Twino unexpecedly fired a lot (some say even 50%) of their employees, possibly related to new regulations in Georgia (their largest market) and Denmark, and then I decided to sell all my loans and withdraw all the money from Twino. These kind of unannounced issues is exactly the reason why I invest only in short term loans – so that if I hear bad news, I can cash out quite fast and let others with longer term loans try to figure out, how bad the situation really is and if the P2P platform will later be able to provide promised buyback guarantees. 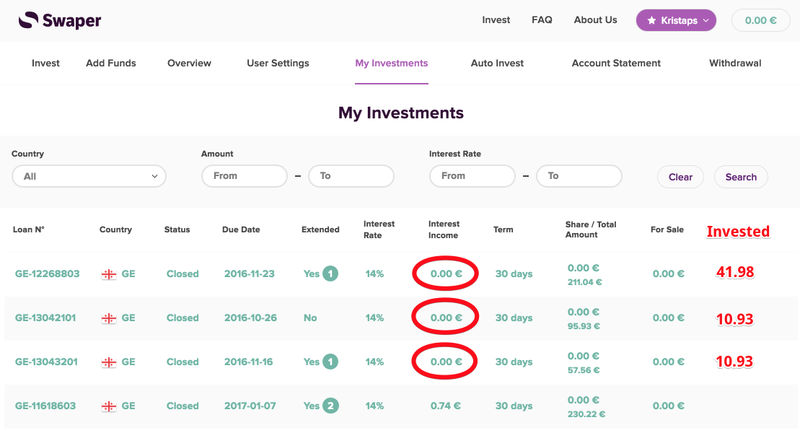 I have mixed experience with Mintos – in the beginning of 2016 I invested in short term loans only, but there were more investors than loans, so big part of money was not invested and produced about 8% return. Was not happy about it, so just bought some other longer term loans, but after a while decided to be more disciplined and sold them in secondary market. And as there were not enough short term loans (up to 50% of money was not invested), in July 2016 I just withdrew all the money. But as Mintos was adding new partners quite fast, after a while I decided to try them again in February 2017. I had to decrease min interest rate to 11%, but since then almost always money is invested. And if in 2016 I was buying only Cream Finance loans, then right now I am invested in loans from already 4 companies: Cream Finance, Lendo, Banknote, ID Finance. I got an offer to try out Swaper.com when they launched in the end of 2016, and they promised 12% return + additional 2% for early investors. I invested some money in October 2016, but quite soon run into some issues. Reports were not correct – some loans had status “closed”, but with 0.00 interest income. Support said – there is a bug in “My Investments” section, and that I should instead look at Account Statement that has all the missing interest payments. And that of course influenced the overall return. After 2 weeks this bug was fixed. But similar to Twino, in last 3-4 months also Swaper has bigger interest from investors than loans to invest in, and lot of money I get back from previous investments, is not invested again. So I decided to sell all my loans and cash out here as well. I might test Swaper later again, but then would expect to see not only enough loans available, but also more info in website about company management. Right now website has social icons, but only FB is active. It is not possible to view stats of an individual loan. No info about people behind the company. In short – Swaper does not provide many reasons to trust them with my money. But as we can see from other examples, in couple of months that might change, so I need to check it once in a while. P2P platforms are not regulated and if they get hacked, go bankrupt or try to scam you, you can loose all your money. Your money is not protected in any way. Guaranteed buybacks sound nice in theory, but can fail in practice. This is not a stable bussiness. Most of loans available in these platforms are short-term loans with 50-150% interest rates for borrowers. In some countries regulations are so strict that these kind of bussineses cannot exist there, in other countries similar policies might be implemented as well. Mintos and several of its partner companies are partly owned by the same investor. More info here: “Peer-to-Peer Lending Platform Mintos Independent Review“. If you look at Mintos page about Loan Originators – in 2 cases they mention “Lendo is a related party to Mintos as per IAS24 definition.” and “Banknote is a related party to Mintos as per IAS24 definition.“, but not for all related companies. Why is it important? If one person controls both Mintos and many of its Loan Originators, then dividing your money between several of them with goal to diversify might not work like you expect it. Just 2 weeks ago Twino fired big part of their team and they have several hundred people working for them, so it is not a small thing. Could it be so serious, they might shut down or have issues with paying back investors? Probably not, but to hear about it from people close to company and not from CEO, and then seeing that their phone support is not working at all, makes me question, if it is wise to invest there. It is quite clear that if they would be in a very bad spot, investors would be the last ones to find out. Swaper is super secretive by default – almost gives an impression they are preparing for shutting down at some point with no consequences to owners, as no one would even know – who is behind the site. P2P is not passive investing. Even if you use Auto Invest portfolios – all platforms make so many changes and often don’t have enough loans to invest in, so XIRR, Net Annual Return and other metrics are not very useful. They might look good, but don’t represent the actual returns, because at least part of time part of your money will be frozen in these P2P platforms without generating any return. You need to follow status of your investments, update settings or in some cases – just withdraw money and move it elsewhere. Taxes can be a nightmare. I asked 4 platforms for advice – how should I calculate and pay taxes. 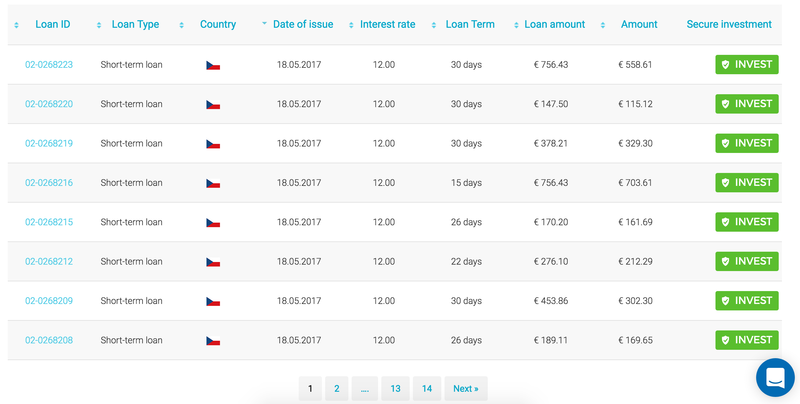 Got different answers – 10%, 23% and in one case – depending on which loans I invest (CZ 15%, ES 19% ES) and I might get to additionally pay the difference between these countries and LV tax rate. Mintos consulted with State Revenue Service, their view: if you invest in more than 2 loans per year, you need to register as person who is doing economic activity (“saimnieciskās darbības veicējs”), and pay 23% tax. If these points don’t make you worried, go ahead – try it out, but be aware – that it would be hard to call it “investing”, it is closer to speculating and gambling. Would I invest 127k in P2P platforms? So I would avoid Bondora, Swaper and Twino at least for now. And all the other Loan Originators in Mintos platform (unless they add new ones with required terms). And I would not mix up any lenders in Mintos – split each one in their own portfolio, and if any of them don’t have enough loans – then drop them and cash out. So 32k into P2P, what about the rest? I would consider converting 10% of cash (or 12,700 EUR) into physical gold. I would consider buying stock sector ETFs like $URA, $TAN and others that have lost lot of value in last couple of years. Again – not more than 5% in each. For the money that is left and unused – I would buy Vanguard Total Bond Market ETF $BND – it is a safe investment with low return, but might cover inflation and can easily be converted back in cash if better opportunities show up. I have no formal education in finance and I am in no way qualified to provide investment advice, so take all of these ideas with grain of salt and decide for yourself. Remember, that it is your money and you will face any consequences for the investment decisions you make. Hi, thanks for sharing all your ideas about the current P2P state. Can I ask where have you heard/found info about reducing employee in Twino? From my point of view, Twino suffers from a lack of new loans for a long time. Whenever my money sits in the account without usage, I reduce my portfolio. So your information on possible issues on the platform is the next reason why to do the complete withdrawal. Have to fix the post – it happened 3 weeks not 2 weeks ago. They did the mass firing on Friday, April 28th just before holidays (Monday, May 1st was not working day in LV) – that is when I heard about it first time, but later got the same info confirmed by 2 other friends. In all cases source were people, whose friends were fired. Thanks for more details. I just finalize selling all my investments and asked for withdrawal. Hope there will be no problems. Besides Mintos and Viainvest there are probably more P2P sites where it would be worth to invest, but I just have not done lot of research and tests. My experience is limited to the companies I mentioned. I would reinvest everything until you feel the need to withdraw everything. I have only 5k in Mintos, here is full screenshot: https://www.dropbox.com/s/qc7g1hrwu1pzav5/Screenshot%202017-05-20%2011.20.53.png?dl=0 – if I had more, then I would split it between several portfolios like I suggested in this post. a chat between some user and support from viainvest, (I think it was on p2pindependent forum) and the was pointing that the owner of viventor is behind viainvest. He was comparing some juristic documents viventor and viainvest and they were almost the same so apparently they were created the same law agency. I will check it and try to post it here. Hi! Did you find out what taxes need to be paid on income from these things? My plan is to do calculations once per year, but probably will stop my P2P investments this year, so won’t need to think about it anymore. I also got a little more aware of the situation after finding the post on Twino firing. Also tried to look for more information and both P2P platforms (German & English) seem to be claiming they also heard rumors about Twino firing quite a considerable amount of staff. It’s a little surprising Twino officially did not communicate any of this whatsoever leaving a number of investors “hanging” and anxious. So I’m not surprised many of them (myself including) simply withdrew the funds. Just wondering – I’ve also heard some rumors about Twino Polish funds being withheld due to tax disguise. Do you by any chance have more info on this & how correct is this info? Hi, no – I don’t have any info about Polish funds being withheld, but you can ask about this in a Facebook group called “Twino Fellows” – Twino CEO is there as well and usually is fast to respond. Regarding Twinos, I have heard recently from the former staff and people connected to their company, that they are experiencing huge overhead and operational expenses due which massive dismissal mentioned in your post could be justified. Sad that they are a private organization and there is no direct access to their financial statements to check out what’s happening there behind the scenes. Well yeah, this isn’t good news and I’d better also stayed out from them, as this is not the best signal for the long-term investment. “I would buy Vanguard Total Bond Market ETF $BND” – could you cover how to approach Vanguard in Baltics or Latvia, to be more specific? I believe it could be an awesome idea to compare local banks’ ETF services, Vanguard and other more shady alternatives for investing in S&P500 or other indices, that could end up in the very interesting reading. I don’t plan to use local banks for investing, they have the highest fees and very often also limited service/features. I’m using Interactive Brokers for options, stocks, bonds. I just logged on to Mintos and I see a bunch of Georgian loans offering 17% with buyback guarantee. I am not limiting the loan term to 1 month though, I can invest for long time periods. But you mentioned Georgia and Denmark are problematic. Can you elaborate on what exactly is the problem? Is there any risk if I stick to loans with buyback guarantee and if so, where exactly is the risk? Thanks! 1) these 17% loans are probably not in EUR, but in GEL, right? Then take into account currency risk as well. In 2012 1 GEL = 0.5 EUR, now 1 GEL = 0.37 EUR, so it has lost about 30% in value against EUR in 5y. If you had invested in GEL in 2012, you would need to get +30% return just to break even, without fees when converting currencies. 2) problem = regulation. These type of short term loan businesses can stay alive as long as they are allowed to ask their clients for yearly interest rates ranging 100-3000%. If a limit is set on that, then also their ability to profit, advertise etc. and stay alive is limited as well. Have not researched it, but heard from people working in this kind of companies, that they expect most of lending companies in Georgia to close. Yes, my bad the 17% ones are in GEL. 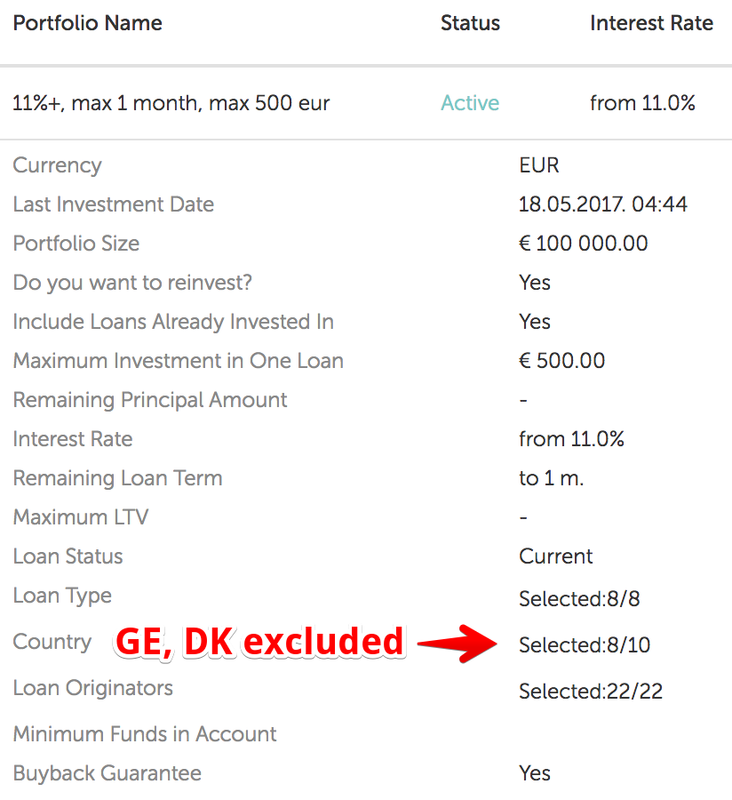 I did a filter for EUR only and buyback guarantee-Yes and I am still getting 18489 loans, starting with hundreds of Mogo car loans @13% interest. So it seems like considering buyback guarantee *which* specific loan you buy is not important? The originator is important(i.e. if there’s bad news about an originator-avoid) but which individual loans you buy is unimportant? If I understand you correctly, the only risk is if the originator will run away, file bankruptcy, or otherwise not be able to honor the buyback guarantee? Hey Kristaps, big fan of yours! Sorry haven’t found how to contact you. Can i ask you, to make an article, about loans and credit cards comparison between different banks? In Estonia right now, it is not the best APR on loans and credit cards, and the banks make a lot chunk of money here. Would like to hear and know your opinion, where it would be better in your opinion to lend money in Europe – banks,platforms, etc. a lot of things changed since the release of this article I suppose. Bondora is now more transparent and there is also option to show your interest according to your preferences. There are a lot of apps functioning with cooperation with Bondora and not much things can be hided in your portfolio. Maybe trying to check it out once again wouldnt be bad idea. Why do you say that p2p platforms are not regulated? Hi Kristaps. Thank you for your article. What do you think about Mogo loans at Mintos? Mogo company is quite clear with their financial statements, and looks strong as their profits prove that. I think the risk there is much smaller comparing to other loan issuers. What do you think? Even if Mintos fails, obligations from Mogo stays, isn’t it? Mogo and Mintos have the same investor, so would be strange if one of them fails, other does not. But I have withdrawn all my P2P investments, so cannot recommend Mogo, Mintos or any other loan issuer. In my opinion these P2P products have too high risk, take too much time (they don’t work as “set/invest & forget”, always some issues – % change, loans are not available, etc., and in the end money is frozen and real return is much lower than advertised) and produce average return. But everyone needs to do his own research and you might come to a different conclusion. where did you put your money then, if you took out from p2p? Great review of the p2p lending platforms. I want to double my investment with one of the platforms and your article really helped me out. Did you discover any other platforms which have a better prospect? Previous Previous post: Kur ņemt hipotekāro kredītu – DNB, Swedbank, SEB, Nordea vai Citadele? Next Next post: What happens when your app is featured on Google Play?